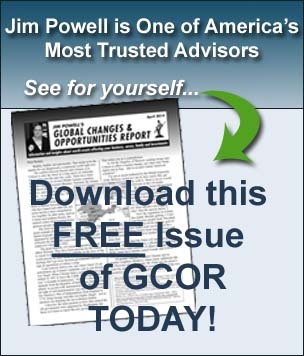 My goal, as the editor of Jim Powell's Global Changes & Opportunities Report, is to find profitable investments for my subscribers. At the same time, I identify potential threats to your assets and effective ways to protect against them. My primary focus is on new developments in the US and the world that create exceptional investment opportunities. I am particularly interested in finding profitable relationships between events that may first appear to be unrelated. Most of the opportunities that I find deliver excellent returns for many years. Many shorter term investments also generate exceptional profits. 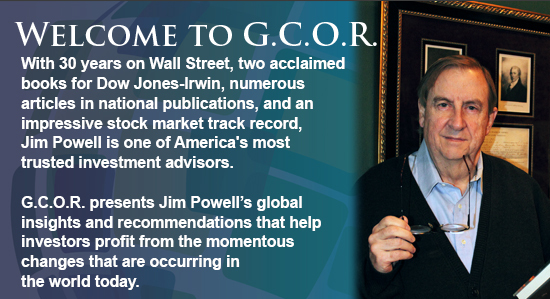 Each month, I publish my findings – and specific investment recommendations – in my newsletter. When exceptional opportunities occur between publication dates, I send my subscribers special email bulletins that explain the situations and how to profit from them. I encourage you to examine my track record, and to read a recent copy of my newsletter. Or to get a better idea of the many services my team offers, please click here. I would very much like you to join our group of independent investors who are determined to be successful during this time of unprecedented challenges and opportunities.